Hello, Bitinvestor, It's been a while ran any HYIP review and today I'd like us to review a great HYIP company and one of the fastest growing companies currently on the Internet, And by that I'm talking of FosterBit which is over 3 months online now. 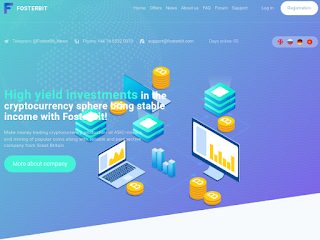 In this review we'll ascertain if FosterBit.com is SCAM or legit, Paying or NOT PAYING, secured or NOT and whether you should invest or NOT. FosterBit claims to be a team of experienced and self-confident professionals who know how to make money on the cryptocurrency market. You, probably know that the market of ASIC-miners is dominated by monopolists, but their era is coming to an end. Many companies pay attention to the production of application specific integrated circuits and will soon compete with such large companies as Bitmain. Our company did not stay away from this process and launched its own production line of new model ASICs that allows to mine more efficiently. The industrial sale of our developments is one of our main icome items. Foster Bit is a HYIP program - A HYIP or high-yield investment program (HYIP) is a type of Ponzi scheme, an investment that promises high return on investment by paying previous investors with the money invested by new investors. - wikipedia. Foster Bit sooner or later may likely stop paying.This is not the main issue anyway but how fast or quickly it might fail... From facts HYIPs with such high ROI only manages to survive some few months.